When Tripp Bowden first went to Augusta National, he went to fish. He calls it a “fishing haven.” He didn’t like golf at all, because the game took up too much of his physician dad’s time. His fishing partner was Freddie Bennett, the “Legendary Caddy Master,” at Augusta National, home of what most consider golf’s greatest tournament, The Masters. Bowden was all of 10 years old when that fishing trip took place. 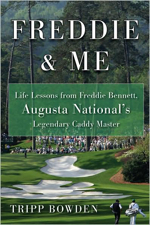 You learn that in the first few pages of his new book, Freddie & Me, a rush of recollection, emotion, love and wisdom, which whirls you through 72 chapters (“even par” as Bowden points out) of the writer’s life with Bennett, at Augusta and beyond. “I didn’t start it (the book) out as a cathartic eulogy, but it just poured out of me—all this stuff, hidden all these years. It was a pretty emotional ride. Some of what I wrote, I didn’t even realize was there,” Bowden said. While the book is a paean to Bennett, it is much more, due to Bowden’s ability as a writer to capture a scene in such a minimalist style. In one of them, Bowden has just had an afternoon tour of the golf course, with Bennett pouring 40 years of knowledge into a few hours before Bowden begins his first round as a caddie. When they get to the fifth tee, there is an old water fountain, which Bowden can’t get to work. He tells Freddie it’s broken. I back away. Freddie slides up to the water fountain, reaches into his pocket, and pulls out a tee. “Exhibit A,” he says, before sliding the tee tip-first into the front hole of the faucet. It’s a perfect fit. “After you,” he says motioning for me to take a drink. He turns the handle. A high stream of water finds my lips. “You right about that,” he says, removing the tee. But instead of putting it back in his pocket, he hands it to me. “Our little secret,” he says. I never tell a soul. Bowden is a native of Augusta. While his dad was not a member of Augusta National, he was Freddie Bennett’s physician. Until 1982, pros who played in The Masters were required to use Augusta National’s caddies. For a time, Bowden was one of them. He was the only white kid in a marvelous collection of black caddies—Tip, Nut, First Base, Bull and Deal Maker—who knew Augusta National better than most of the members. Among other things, it was Bennett’s job to pair up the caddie with the golfer. These weren’t just any golfers. As it has always been, the current membership roster at Augusta National is a mixture of business tycoons (Bill Gates, Warren Buffett), politicians (George Bush, Sam Nunn) and sports figures (Lou Holtz, Jack Nicklaus). As Bowden says in the book, for every member that flies out on a commercial airline, 10 more leave by private jet. Bowden learns from Bennett how to read people as well as Augusta’s treacherous greens. While Bennett gives the author his first golf lesson when young Trip is fishing, it is the life lessons Bennett tosses out to Bowden that help him through high school, a college golf career, and finally, in the end, out into the world of business. “What I learned from Freddie is that nothing is impossible. I was given a gift (writing the book), and I could hear his voice telling me, ‘You can do this.’” Bowden said. For anyone who is a Master’s fan, Bowden offers wonderful “inside the ropes” color, from the “bone-in” pork chop sandwiches wrapped in (Masters) green cellophane, to what could happen to the golf bag of a guest of a member (a tightwad billionaire) who didn’t tip (you’ve got to read the book).